Search results show site after site claiming the original food guide pyramid was released in 1992 and almost nothing about the 1950s version I was trying to find information on. I never could locate an image of the original 1956 USDA “Basic Four Food Groups” pyramid. 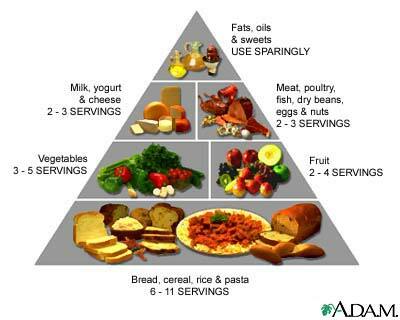 Simply search for information about the USDA Food Guide Pyramid. I spent HOURS and have yet to find the original government released Food Guide Pyramid created in the 1950s that I remember from when I was in school. Schools taught the pyramid as health science, but where it came from, who decided what was on it, and who REALLY benefited from it is an interesting and important story that few understand. Finding the real truth about it in a search engine is VERY difficult. Another search you can use for testing is “Dietary Guidelines”. See what results you get. Luise Light, the architect of the original version was a nutritional expert who made her recommendations based on valid food science in the 1980’s. But certain members of the food lobby rejected her prescription for small servings of their products so they strong armed the USDA, urging them to bury her work. By 1992, they returned her Food Pyramid to her unrecognizable. I disagree with FoodForeThought‘s conclusion that eating by the food pyramid is why people are overweight today. I lay that at the feet of food that does not contain the nutrients we need and the enormous amount of things we are ingesting that are NOT FOOD including chemicals, genetically modified organisms and especially high fructose corn syrup that is in almost every product on the shelf! Your food pyramid article is fantastic. Are you use the food additives for production of food ? If you use the food additives with food manufacture there is no side effects. Personally, I do not eat packaged foods that contain additives. I only eat non-gmo, organic food, much of it raw or barely cooked as in stir fries. This food pyramid article is really good. I’ve enjoyed reading the original content and fresh ideas you wrote. You are good at writing on this topic and I hope I can read more of your work soon. Actually, food pyramids are intentionally misleading because of conflicts of interest as explained in this post. Note that there is enough of my work already on this site to keep you reading for a long time. Will be honest only came on your blog when read heading ? Food pyramid? I had never heard of it. Maybe me being a bit dense. But was intrigued so I thought I would have a look. Glad idid the pyramid is quite self explanatory when you look at it. Reinforces what percentage of what type of food should be in your diet. Should be up in school classrooms if they aren’t already. It is important to eat a balanced meal. But too much of carbohydrates especially white bread and white rice might not be good for you. Try try to eat whole wheat bread and brown rice instead if possible. Whole wheat is when the farmer chargers more for skipping the removing the chaffs step. I don’t see much benifit here. By now, people should understand how unhealthy processed packaged foods are and start eating food as it was grown. It isn’t just chaff because in most grains, fruits and vegetables much of the nutrient value is just inside the skin. Over-processing it reduces nutritional value. I agree with you. Processed food are the ones causing obesity and sicknesses in people and they are very accessible to people. Most of the food found in the supermarket and fastfood restaurants are mostly chemicals…it is scary. And children are eating them! So sad. I totally agree with you, Nicole. I just wish more people would understand they need to return to eating whole, fresh foods grown without GMOs or chemicals. There is growing awareness as anyone can see by searching for #eatlocal #buylocal #growlocal on Twitter. This food pyramid can truly be a problem especially if it has been commercialized by those who have the power. The solution is for the people to be more particular of teh food they eat. After-all it will still be them to decide if the food they eat would be healthy for them. The fast food industry and and obesity are linked directly.You not only consume empty calories but also- non health -promoting soft drinks.The obesity crisis in America is fueled by a nation bent on self destruction by ignoring common sense and eating” EASY” food.The food pyramid is just one facet of the problem.What about statistics that state that a third of children do not play outdoors anymore? Sad but true.Obese kids grow up to be obese adults. check out thetruthaboutabs.com to learn how our government has the nutritional pyramid set up wrong with cereal, bread, whole grains, rice, carbs as the largest portion of our daily intake. totally wrong. Large cereal companies pay Washington lobbyists to keep it that way. i thinks its the lifestyle and the eating habits of people that is the cause of obesity.. I agree the food pyramid is not why people are overwieght. It is the junk you mention, and the every growing portions of it. The amount of power lobbyists have in this country is sickening. Most laws are written by lobbyists, not politicians, even something as simple as the food pyramid is bought and sold. The current health care reform bill was heavily influenced by the health care industry and does not solve some of the real problems with health insurance.